Opal designer boardroom tables, have a stylish and practical gloss finish laminate top, complemented with slim line leg detail. Available from stock the Opal boardroom tables can be delivered in 3-5 working days. The opal boardroom tables have been designed to emulate the high gloss designer style, whilst also maintaining great value for money and quick delivery. 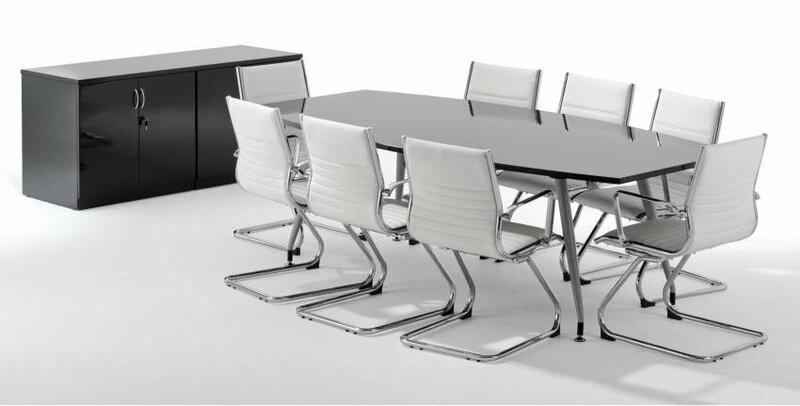 To complement our range of Opal boardroom tables we offer a wide range of designer boardroom and meeting room chairs, making Online reality your one stop shop for quality boardroom tables and furniture. To further complement our range of quality boardroom tables we provide customers with a free design and space planning service, managed in house by our team of designers. Contact our team today or browse through our range of boardroom tables.